This evening, my sister Linda and I viewed the recently released movie, Dawn of the Planet of the Apes, at the theater. The second in the new Planet of the Ape series, this was a must see since we had not only seen the Rise of the Planet of the Apes in 2011, but also watched the original series years ago. Dawn of the Planet of the Apes stars Gary Oldman, Jason Clarke, Keri Russell, Andy Serkis, Toby Kebbell, and Nick Thurston and it is directed by Matt Reeves. This sci-fi, action, drama is rated PG-13, for violence, and has a run time of 2 hours and 10 minutes. 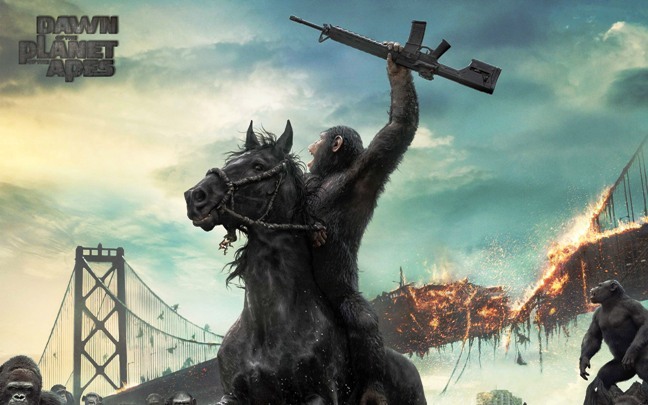 Set 10 years later than the first movie, the band of apes, led by Caesar, has established a home and a way of life in a post apocalyptic type world. Most of the humans have died from the ALZ-113 virus that scientists created in a lab and were testing on apes. There is a remnant of humans, apparently genetically immune to the virus, living in the remains of San Francisco. When the two groups of survivors meet, hostilities quickly mount on both sides. Trust is fragilely established between Caesar and the human, Malcolm. But that trust is threatened and both sides are brought to the brink of war by the betrayal of apes and humans. Fear causes those who are weak, or who have not been able to heal from their past wounds, to seek to destroy the other species. This movie closes with war imminent between humans and apes, and sets the stage for the next movie in the series. Powerful words. Powerful emotions throughout the film. Powerful, thought evoking movie.